This past week I experimented with a couple of recipes to try to use up what we had here at the house. On Sunday I shared this picture of one of my experiments on my Instagram (facebook, flickr, twitter, etc.). There was such an interest in these that I thought I'd share with you how I made them. (They were really easy!) The 'recipe' is at the bottom of this post. First, let me go ahead and share my meal plan and recipe review for the week. I'm linking up for Menu Plan Monday at I'm an Organizing Junkie. Broccoli Cheese and Potato Soup: I've made this before, and we really enjoyed it again. The temperatures dipped over the weekend, and I wasn't feeling well so it was perfect. I did cook up a little Conecuh sausage and we 'topped' the soup with it. Yum! Skinny Tuna Noodle Casserole: This was part of my last Pinning with Purpose. Though Pat had his doubts, it turned out really well. I might just make it again. As I mentioned above, this recipe originally started as a way for me to use up something I had on hand. I had used one sheet in a box of Pepperidge Farm Puff Pastry for the quiches a week or so ago and the other one was defrosted and ready to go. I just had to come up with something before it wasted away. I'll admit that I just eyeballed the measurements. Feel free to do the same to your tastes. ~Mix cinnamon and sugar together in a small, shallow plate. ~Lay the puff pastry out on your work surface (I placed mine on a piece of parchment paper for easy clean up). Using a pizza cutter, cut the dough in half and then into about 1 inch wide strips. 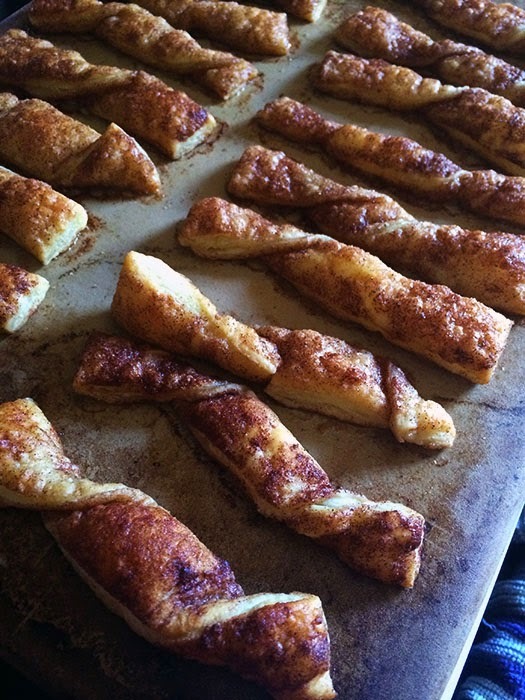 ~Brush melted butter onto either side of the dough and then dip the dough into the cinnamon sugar mix on both sides. 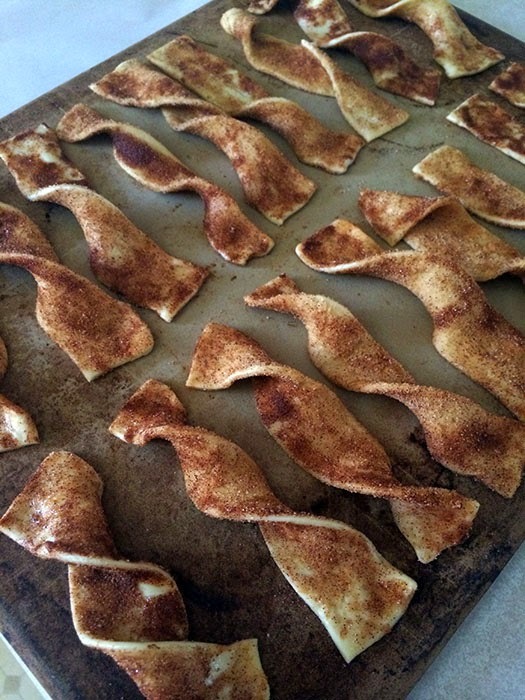 ~Slightly twist the dough before placing it on a baking stone or parchment paper lined baking tray. ~Bake in oven for 12-15 minutes or until done. Like I said, these were super easy and so good. I served them with a banana. We ate every last one of these little treats...oops. I suppose you could use the whole box of two puff pastry sheets and just double the other ingredients. Enjoy! That does sound yummy! Thanks for the recipe. Well, these look dangerously simple! 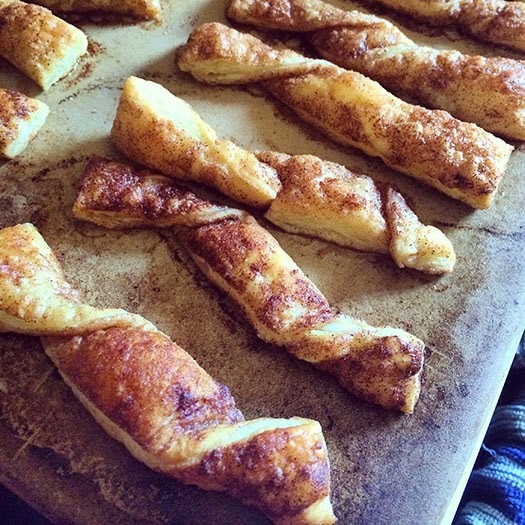 Those cinnamon twists look so good. Thanks for sharing the recipe!